What should I buy or save to make awesome crafts? Well, here is a craft supply list of basic and not so basic materials that will keep your kids entertained for hours. And the best part is that the supplies are not expensive and can be found at your local box store such as Walmart or online at Amazon. Here is a tip: look for back to school sales in August and September as paper, crayons, colored pencils, watercolors, and glue that are on sale. Be sure to bring your craft supply list to the store. By the way, you will find ideas on how to use your craft supply list too. So grab the kids, some easy to find materials and let's have some fun. Oh, there is also a handy checklist that you can print and take to the store with you so that you don't forget what to buy. 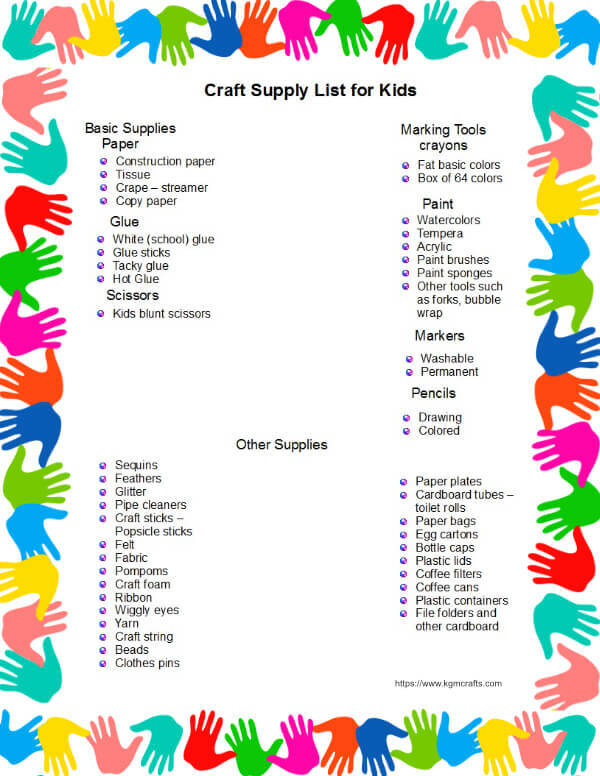 Don't forget to download your craft supply list! To make sure that your craft supplies are safe, look for the AP (Approved Product) Seal. You can learn more about the seal and find a list of approved products on the ACMI website. Construction paper is almost a must for kids craft supplies. The packet that has 240 pages is nice as it has ten colors. Pink, red, orange, yellow, green, blue, purple, brown, black, and white. Each piece is 9 by 12 inches. Construction paper is great for crafting with young kids. They can use it to draw pictures, fold, cut, and glue. There are so many things your kids can make with this product. Tissue paper makes the best suncatchers. Although it can be frustrating for some young children to use. It can be hard to pick up and can stick to gluey fingers. Streamers are used for decorating at parties. In crafting you can use them for wrapping around cardboard tubes. When buying glue look for name brands. Sometimes the off brands don't stick. White glue also called school glue is good for most crafts. Glue sticks can be used to glue paper together. It is great for gluing tissue. There is even one that is colored purple and turns clear when it dries. It is great for when you want to see where you are gluing. Young children like using glue sticks. Tacky glue is great when you are gluing something other than paper such as craft foam. Use hot glue when you want a more permanent hold. Be careful though as the glue can be hot. Supervise children when the hot glue gun is out. Make sure that you buy ones that actually cut paper. For young children buy blunted ends. They are a little safer than the pointed ones. Then teach your kids how to use scissors safely. You will also want to supervise children so that they only cut what you want them too. With colored paper, scissors, and glue your kids can make a lot of cute things. Paint is messy but usually is fun for kids to use. Watercolors are transparent. It is good for painting pictures. Tempera comes in several forms such as liquid, powdered, and solid. It is nontoxic and washable. The liquid is perishable. The powdered should not be mixed around children as it is harmful if inhaled. Finger paint is made for young children. Acrylic can dry relatively quickly. It is great for painting on rocks or wooden items. Though it is not recommended for young children. You will also want a variety of tools to paint with. When you are in the paint isle buy some brushes and sponges. There are ones made especially for kids. Also look around your home for items that can be used for painting such as bubble wrap, forks, and kitchen sponges and brushes. Buy large ones in primary colors for very young children as they don't break as easily. When the kids are older the box of 64 has a nice assortment of colors. You can find washable markers for young children. They are large and come in primary colors. They will bleed if they get wet. Black will even separate into different colors if it becomes wet. Permanent markers are great for coloring on plastic lids and such. Be careful as they are hard to remove from most surfaces. They also have a smell that might be offensive to children. Buy some standard pencils to outline shapes, etc. that you need to cut out. Colored pencils are also nice if your kids like to do a lot of coloring. A girl (boy) can't have too many supplies. Sequins are sparkly tiny circles that are fun to glue on to crafts. Glitter is messy but adds sparkle to crafts. One way to keep the mess down is to use glitter glue or pens. Pipe cleaners or chenille wires come in an assortment of fun colors. They are easy to bend into flowers, animals and other cute items. They are also great for holding pony beads. Be careful as the ends are sharp. Clothespins come in a variety of shapes and sizes. Some are called doll pins and come in flat and rounded. Others have a spring in the center. Use clothespins to make people, animals, and bugs. Beads come in lots of different sizes, shapes, and colors. You can string them and make jewelry. String the beads on pipe cleaners then bend into shapes such as this turtle. Craft sticks also called Popsicle sticks are inexpensive and make cute items. On this page, you will find animals, bugs, flowers, and other cute things. Wiggly eyes are really inexpensive. They make great eyes for monsters, people, animals, and bugs. Yarn is used to make pompoms, hair, and used in other projects. Don't buy the expensive stuff for crafts for kids. Most of the time the inexpensive ones work fine for craft projects. Here is a section of yarn projects. Craft string comes in many colors. Some girls use it to make friendship bracelets but it is also good for making dolls, bookmarks, and other sting needed projects. Pompoms. You can buy pompoms from the store or make them from yarn. They make cute animals and monsters. You can find more ideas here. Felt is great for kids! People sometimes use it for their first sewing projects as it does not fray. Fabric isn't used much for making kids crafts. It can be used to make book covers, and doll clothes. Ribbon comes in different styles such as curling, lace, and regular. You can find it in the party and fabric section of your store. Craft foam such as letters, holiday symbols, and other cute shapes usually come with a sticky backing so they are easy to add to crafts. You can also buy sheets so you can cut your own shapes. Feathers and are used a lot when making birds. Look around your house, there is a lot of items that make great craft supplies. Recycled materials such as cardboard rolls (toilet rolls), plastic lids, bottles, jars, coffee cans, cardboard, and bubble wrap. Coffee filters. Make marks with a water-soluble marker then drizzle water over the marks and watch them run. Paper plates are great for making faces. Faces of people and animals. You can also use them to make other things. You can see how here. Paper bags are good for making puppets. Egg cartons have lots of uses. Use the well to hold small craft supplies such as beads. Or use them for holding paint. 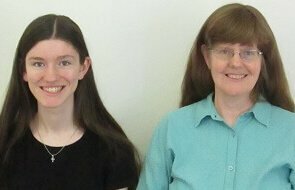 Or make items such as a cross or animals. Plastic silverware You can dip forks and knives in the paint and make pictures. Use forks and spoons to make people. Did you go crazy buying everything on your craft supply list? Now is the time to keep it organized. Come back to this page often when you need inspiration on how to use your craft supply list for kids.